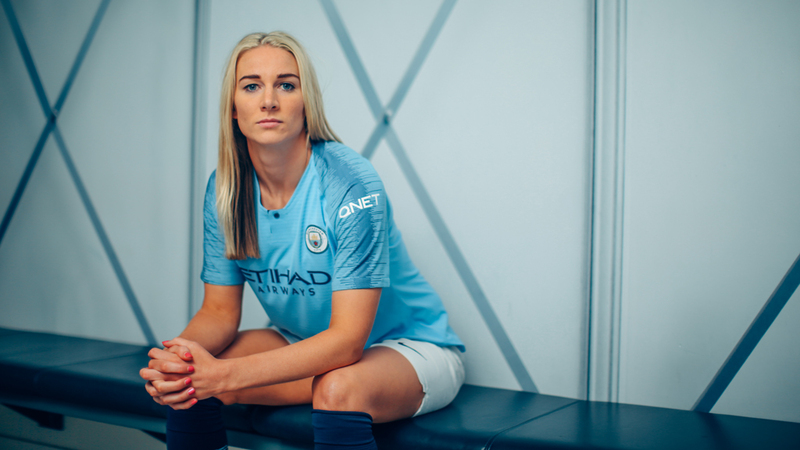 Manchester City goalscorer Gemma Bonner. 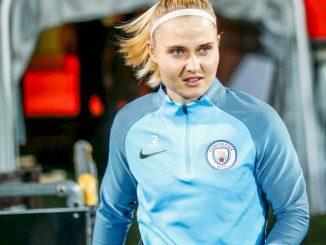 Manchester City led for most of their UEFA Women’s Champions League Round of 32 tie at Atlético Madrid but the home side eventually rescued a draw. 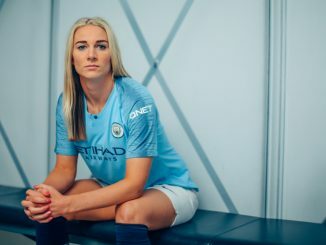 Nick Cushing’s side banked an important away goal 14 minutes into their first leg tie at Atlético Madrid, Gemma Bonner getting her first goal for the club when heading home a Caroline Weir corner at the near post. The hosts fought back and Karen Bardsley had to tip over Amanda Sampredo’s powerful drive, before Elena Linari’s goal-bound effort was cleared by Tessa Wullaert. More pressure followed after the interval with Bardsley somehow blocking Ludmila Da Silva’s header and Jennifer Hermoso blasting the rebound over the bar, then Bonner had to deal with another Linari effort via a corner kick. 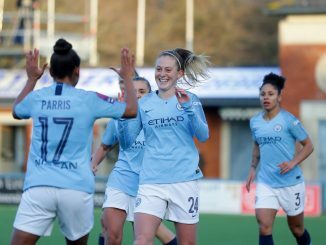 Clare Emslie came off the bench and swiftly went close for City but Atlético finally got their equaliser on 89 minutes, Kenti Robles’ cross deflecting in over the goalkeeper. Slavia Praha struck three times in the last 27 minutes away to Gintra Universitates in Lithuania, a brace for Michaela Dubcová and the other by Tereza Szewieczková. Lillestrøm made a perfect start at home to Zvezda 2005 with Anja Sønstevold scoring after only 2 minutes. Ingrid Kvernvolden doubled the lead and Emilie Haavi added a late third. Second-leg ties are being played on 26th or 27th September, with the Round of 16 draw scheduled for 1st October.